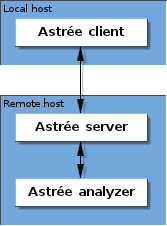 The Astrée client, which you use to set up an analysis and view the results. The client offers both a GUI and a batch mode for easy auto­mation and integration. 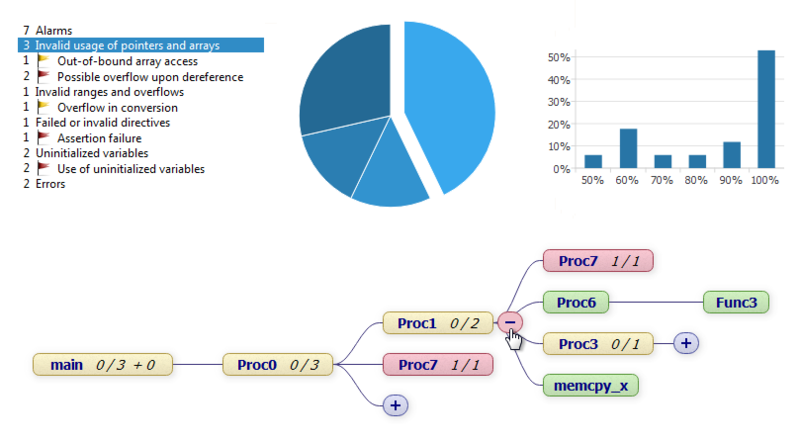 The analysis server, which carries out the actual analysis (or several analyses as separate processes). Both parts may run on the same machine at once. In production, however, the server typically runs on a powerful remote host, while clients are run by the indi­vidual developers and managers on their PCs or other devices. Your license file determines how many clients may connect to the ser­ver at the same time, and how many ana­lysis processes can run there in parallel. Each analysis process may also briefly spawn a filter process for stripping incompatible expressions (e.g. inline assembly) from the C source code. Astrée can also be configured with different ABI (appli­cation binary interface) settings. Lastly, you can supply formal analysis directives to provide external information to the analyzer, e.g., about the environ­ment, or to steer the analysis precision. The directives are specified in the dedi­cated, human-readable Astrée Anno­tation Language (AAL), so that your source code does not have to be modified. The location of the directives is speci­fied over the program structure and is robust with respect to line numbers. Various statistics are compiled. Interactive tables, graphs and charts let you quickly see which code areas are most prone to which kinds of errors. The analyzer also provides coverage information showing unanalyzed code statements. In ab­sence of definite run­time errors, code reported as unanalyzed is defi­nitely un­reachable. You can also use the integrated RuleChecker to check your code for adherence to standards such as MISRA, CWE, ISO/IEC, and SEI CERT C.
Lastly, you can use Astrée to check for functional program pro­perties by a static assertion mecha­nism. If Astrée does not report the assertion to be violated, the asserted C ex­pression has been proven correct. Astrée will always stop with an error if indispensable data is missing or if source files cannot be correctly parsed and translated. 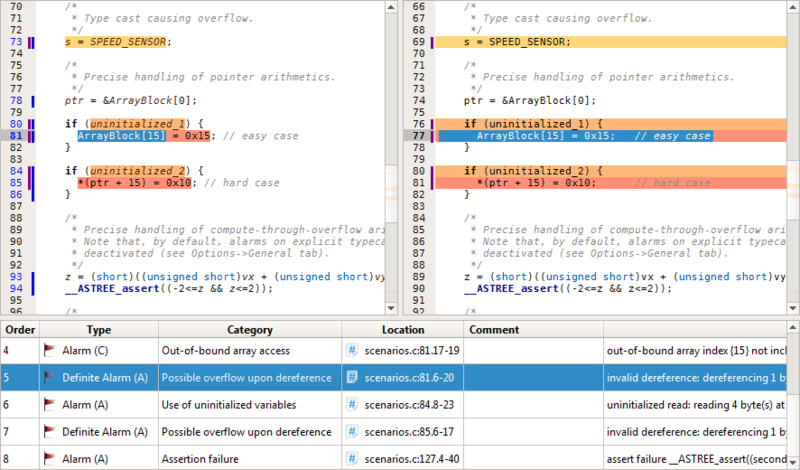 Every error can be interactively explored, commented on, or fixed right away in the built-in C source code editor. Possible false alarms can be marked as such using AAL annotations, so they no longer occur on subsequent analysis runs. Alternatively, you can tweak the analysis settings or increase analysis precision for select code parts. After that, you can run the analysis once again and examine the improved results. These steps are repeated as needed, until all alarms have been dealt with and no errors are reported anymore. At that point, the absence of errors in your code has been formally proven. Once your C code is error-free, you can use our formally verified optimizing C compiler CompCert to guarantee that all safety properties verified on the source code also hold for the generated executable. CompCert is the only compiler worldwide that is mathematically proven to be free of mis­compilation issues.